It all began when my boyfriend and I decided to have a contest over who could make the most creative and tasty veggie burger. I was nervous: I know a good vegan burger when I taste it, but my boyfriend is something of a veggie burger connoisseur. All day, I wracked my brains trying to imagine what the best entry would be. Should I go with something traditional, like my foolproof tofu burgers? 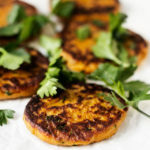 Something sweeter and softer, like my sweet potato and chickpea burgers? How about my homemade sunshine burgers? 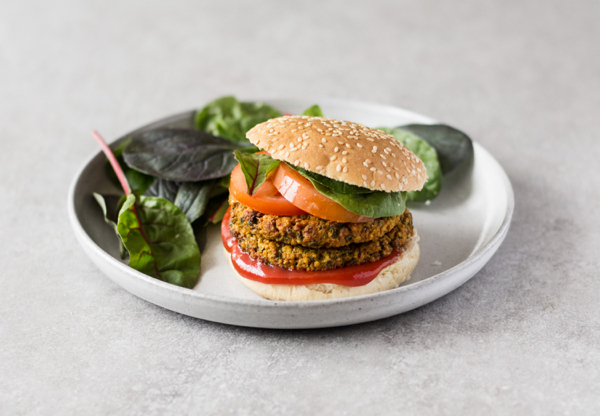 In the end, I decided to create a new recipe in the form of these ridiculously healthy millet, kale, and yam burgers. The idea was to take a bunch of nutritious ingredients that I adore, and shape them into a dish that screams comfort food. I think I succeeded. These burgers aren’t as simple as my foolproof tofu burgers are, but I think you’ll find that they’re easy to prepare if you work in stages (I cooked the millet and mashed the yams the night before), and they’re certainly not challenging in terms of technique. They’re gluten free, and they boast about ten grams of protein per burger. 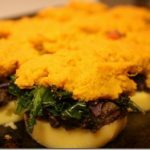 Fans of my savory polenta stacks with black beans and greens and beans will also find plenty of similarities between that dish and these burgers: no surprise, given that both utilize a laundry list of my “dessert island foods.” I hope you try them, and love them. Preheat your oven to 400F. Prick the sweet potatoes each a few times with a fork and bake till tender (about 40 minutes). Decrease oven heat to 350F. While the sweet potatoes bake, place the millet and 1 cup water in a medium sized saucepan or pot. Bring to a boil. Reduce the heat to low, cover, and simmer 20-25 minutes, or until the liquid has absorbed and millet is tender. Remove the millet from heat. To prepare a flax "egg," mix the tablespoon flax meal with 3 tablespoons warm water. Allow it to thicken for 5 minutes. Place the millet, chickpeas, and kale into a food processor fitted with the S blade. Pulse a few times to combine. Scoop the flesh of the two baked sweet potatoes into the processor, along with the flax "egg." Continue pulsing until the mixture is uniform. Transfer the mixture into a mixing bowl. Add the salt, pepper, cumin, chili powder, smoked paprika, and breadcrumbs. Mix everything well with your hands, then shape the mixture into 6 patties. Transfer patties to a parchment lined baking sheet and bake for 25 minutes, flipping once halfway through. Serve with fixings of choice! Leftover burgers can be individually wrapped and frozen for up to 1 month. The first night we enjoyed these the old fashioned way; with Ezekiel burger buns, organic ketchup, and a big salad. But for the past few days, I’ve made lunches by placing a cooked burger atop a big green salad, and adorning it with a smear of sweet potato hummus. Yum! These burgers ought to freeze nicely for at least a month, and they’ll last in the fridge for at least four days. They’re great, easy, portable leftovers! As for the burger competition, these guys were neck and neck with the boyfriend’s, which were made of cooked buckwheat and beets. They were amazing, and my new goal is to replicate them. But that’s a recipe for another time. Have a happy, restful Sunday! See you back here tomorrow. OMG, those look fabulous!! Love the combo of ingredients. Sounds awesome! These look amazing! I love lentil burgers lately—I don’t do anything too wacky, but sometimes I stuff things in the middle (like nut cheese or something with zip!). I love veggie burgers and bean burgers, and making my own has proved to be so satisfying. I love that you took pretty much every badass ingredient in the kitchen to make one crazyawesome burger! Yum! I’ve been meaning to try millet for a while now and these seem like the perfect occasion. Not to mention the fact that they feature two of my favourite foods: kale and yams. Thanks for another delicious sounding recipe, Gena! And good to hear about those findings on coconut oil. I use it as the fact in my homemade, low-glycemic chocolate and I have to admit, I’d be pretty sad to give it up. Hear hear about the best food being that which you cook with both love and the conviction that it will be delicious! Sadly I just finished up the last of my millet. Fiddlesticks! I would love to take a stab at these. You’re right, there are some steps and stages to them but anything that yields 10 and I can freeze, i.e. planned leftovers which is music to my working mother’s ears…well, they are worth trying! I confess that I never make meatless burgers. Probably b/c I never liked burgers as a kid when I still (Rarely) ate meat, and so as a teen and adult and not eating meat, I dont crave the burger feel. Other than a brief morningstar chic’en nugget phase and boca burger phase 10 years ago, I don’t usually do meatless burgers/patties/loafs. I could see myself falling in love with these really fast. I have some burgers frozen right now, made with sweet potatoes, but my future is looking bright indeed. These sound amazing, and I will definitely make them. I must. I love all kinds of veggie burgers, and the weirdest I made had beets and oats in it, but it was still good! Just finished off a veggie burger. Sunshine burgers are probably the only packaged one I can eat and they are delicious but a rare treat. I just posted about a bean burger that I frequently make on my blog last week. I put some dill in it and it was perfect, just a little pickle flavor added. Funny you and M have competitions like that. Cute. Gena, one of the first veggie burgers I made after going vegan was your Sunshine burger. THIS burger may rival it! I cannot wait to try it! My wheels are also turning on a raw version … I may try sprouting some millet next week to see what I can come up with. My wackiest burger: I had sprouted lentils. I had beets. It was Valentine’s Day. So, you guessed it, I had a very red burger (freakishly looked like raw meat). Though freakish in looks, it tasted quite good! Wow-looks delicious! When do we get to learn more about this mystery M? These burgers look incredible! Yams, kale and millet are personal favorites of mine as well, so I will definitely be trying these for sure!! 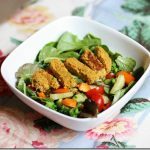 Great post, and through it I discovered you “sunshine burgers” recipe which looks like an amazing way to put more rice & sunflower seeds in my diet, which I’ve been wanting to do! 🙂 Thanks! As for this post itself, it does look like a health foodie’s dream! Now if yams weren’t so hard to find where I live… I wonder if substituting with potatoes or sweet potatoes would be ok – although certainly not as healthy, especially the former. Absolutely delicious!! Do you think this would work with quinoa? Yup, I think quinoa would work great! Now that I am home for spring break, I am SO making these! I just bought a head of kale, too, to make massaged kale salads. These look FANTASTIC!! I am currently planning meals for the week ahead & definitely adding these to the list! These look amazing! I love all of those ingredients. Great idea to add them to salads, too. Can’t wait to try! Looking for new ways to use millet, and I always buy too many yams 🙂 Can’t wait to try this! Cumin makes everything delicious…! Haha I love the name! And if I haven’t mentioned it, your photography has been awesome lately! I especially love that last close-up. These sound amazing! Classic comfort food at its healthiest. Gena these look delicious, thanks! I will certainly try them as soon as I’m done with the big batch of Thai Mung Bean Burgers I recently made. 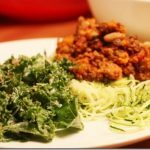 I got the recipe from http://www.nourishingmeals.com ? This is one of my favorite sites for super delicious healthy recipes. Though not 100% vegan, they are dairy and gluten-free. I definitely recommend checking it out! Thanks! I actually do know the site. I have to admit, I have a hard time with the Weston Price/Sally Fenton ethos, which I don’t agree with. And since veganism is a personal priority for me, whereas GF isn’t (I like to cater to GF readers, but I eat wheat and gluten), I sometimes struggle with the non-vegan emphasis. All of that said, I LOVE the whole foods attitude, and those burgers look amazing! These sound absolutely delicious. I’m doing all raw today but it’s one of my few days off to cook so I may pre-prep like you did! Looking forward to it, really. Can’t wait to see M’s results! I just love this post! Literally yesterday I was daydreaming about summertime and homemade veggie burgers!! I love making them and freezing them!! Oh excellent, thanks for the weeknight dinner/lunch idea! Always looking for those. 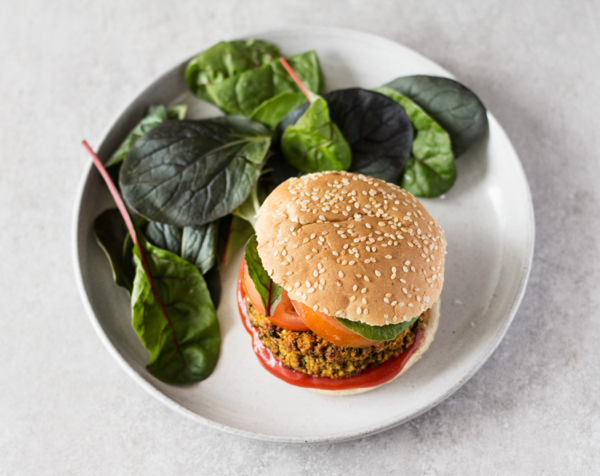 Admittedly I sometimes take the lazy route with Trader Joe’s frozen Masala Burgers–totally flavorful and spicy over greens in a pinch. Btw…I’ve seen quite a bit lately on the “Dangers of Soy” including less processed forms such as edamame, tofu, and tempeh. Would love to hear your thoughts on this. What about M’s burger? And who won the competition? Need more details! Thank goodness I cooked extra sweet potatoes last night! And have a rice maker now! I’ll see if I can give these a try tonight. update: they are great! Definitely helped that I had leftover sweet potatoes on hand, plus brown rice leftover from a meal out. I’m eating them wrapped in lettuce and dipped in veganaise. I’m craving raw ketchup though… I’ve always hated ketchup, but then I tried a raw version and have had a hankering since. nice recipe! I just found this blog and it all sounds so good! I searched the net for a Chia seed pudding recipe to find out what it was and found it here! It sounded so appetizing, I tried it right away! I love it! All your recipes sound so good I want to try them all, my grocery list today has the makings for these “burgers” and the walnut “cheese”. I am an omnivore who is trying more vegan and raw to try to wean myself from so much animal products and start feeling healthier. Your blog is really encouraging! Thank you so much! These look amazing. I have all the ingredients in my kitchen and am making them tonight! thank you Gena! It sounds like this boy is a great match for you! 🙂 That is my idea of a fun weekend! Your burgers look fantastic. My favorite burger is my beet burger. Like this one it takes a few steps to make, but it’s totally worth it! These burgers look wonderful, thanks for the recipe. 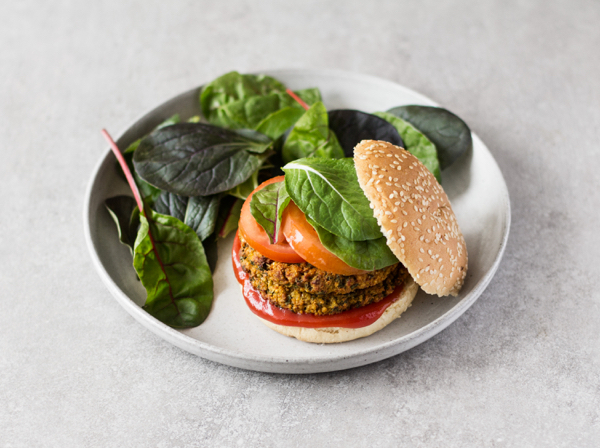 I’m starting to appreciate vegan burgers more now, both raw and cooked, as a salad alternative and something I can take to family gathering dinners. This isn’t the simplest recipe, but it looks worth the effort! I am a HUGE fan of meatless burgers, especially when they contain a great grain! These sound delicious! Well of course all of your favorites are my favorites! I made. Kale salad with millet and white beans on it almost weekly! Never thought to turn it into a burger! You are brilliant, my friend, brilliant! Lol! Look great! Veggies burgers are actually the only “fake meat” product I enjoy. Nothing else ever tasted good or appealed to me! Can’t go wrong with baked chickpea and yam anything! .. a bit complex for what I’m used to but it looks worth the time and effort… thanks for sharing. I was happy to see that article in the NYT too–so much so that I devoted an entire post to it! starred and on the future to-make list. fyi, its been verified repeatedly that the saturated fat in coconuts dont act at all like their animal fat counterparts. cant wait for M’s version! I made these last night and served them to omnis, thumbs up from all! I am counting the minutes until lunch time when I’ll be eating a leftover burger on top of my salad. These really pack a nutritional punch and are so, so delicious! Had these for dinner tonight (made with quinoa in place of millet as I had so much on hand) and they were a hit! I enjoyed mine between two slices of Ezekiel bread, Veganaise, organic ketchup, mustard, and pea greens. I have yet to try one of your recipes and not be floored by how delicious it is. Thank you Gena! I thoroughly enjoyed this recipe, but did find that the cinnamon was a bit too dominant in the end. Next time, I would decrease down to 1/4 tsp. Otherwise, great texture and flavor combo! Good to know, Lisa! I appreciate the feedback.